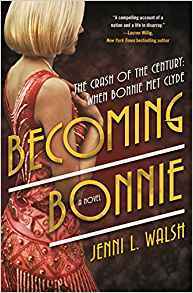 Jenni L. Walsh is the author of the new novel Becoming Bonnie, which focuses on the Bonnie of Bonnie and Clyde fame. She has worked as an advertising copywriter, and she lives in the Philadelphia area. Q: You've noted that you originally wrote about Bonnie and Clyde's crime spree, before turning to telling Bonnie's story. Why did you decide to focus on Bonnie? A: Yes, when I first began writing, I had every intention of telling their crime spree story. While there are various nonfiction accounts of Bonnie and Clyde’s life on the lam, I saw an opening for a fictional retelling. I dove in, but Bonnie and Clyde’s background came as a surprise to me. There isn’t much known about Bonnie’s adolescent years, but from what I gathered, she started life as a very wholesome individual. Bonnie sang at church, received straight As, won spelling bees, and participated in beauty pageants. I had this moment where I thought… but she ended up as a fugitive? How? So, I decided I needed to tell Bonnie’s origin story. Becoming Bonnie was born, and chronicles how she goes from doll to gangster’s moll during the Roaring Twenties. Q: Can you say more about the research you did to write this book? A: As mentioned, as far as Bonnie’s past, there isn’t a ton of information out there. I took what I could find and filled in the rest with plot elements that align itself with the era of the 1920s. Hello, speakeasies. Otherwise, there’s a plethora of “Bonnie and Clyde” information out there. Memoirs, nonfiction books, historian blogs, FBI records, newspaper articles, poetry, diary entries (from Bonnie’s little sister), court records, etc. Interestingly enough, though, the information I found often contradicted itself. For example, with an account of a shooting: a witness tells it as version A, the police tell it slightly different in version B, the newspaper in Town A tells it as version C, the newspaper a town over (who wants their own claim to fame) tells it as version D, a Barrow Gang member who is later on trial tells it as version E (when he’s trying to get a lesser punishment), and Bonnie and Clyde tell it as version F, through poetry and quotes/word of mouth. It made getting the story straight difficult at times, but it also gave me a little wiggle room as I could pull in the details that worked best for my story. Q: Did you know how you would end the novel before you started writing it, or did you change things along the way? So, along with a bunch of other edits, I added another hundred pages or so showcasing the duo together as their life of crime kicks off. I’m really glad my editor pushed me to take the story further. A: This is a hard question, geez. I’m drawn to novels with “based on” or “inspired by” storylines, so my hat goes off to authors like Hazel Gaynor and Greer Macallister. 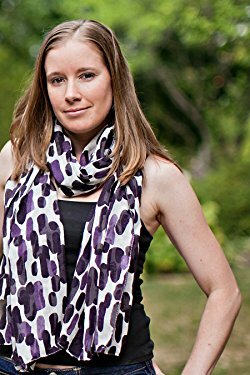 Beatriz Williams often writes new novels that feature characters from previous novels. I think that’s pretty cool. Ruta Sepetys has an amazing way with words and bringing historical details to life. How’s that for starters? If you haven’t checked out their books yet, I definitely recommend. A: I’m working on a companion novel to Becoming Bonnie, which is called Bonnie. While it’s a follow-up to Becoming Bonnie, this second book completely stands on its own. And, it’s the crime spree story. So, if that’s what you’re after, it’s coming your way in spring/summer 2018. A: I’m also working on a narrative nonfiction series for middle graders, which I’m really proud of. The series, called Brave Like Me, is coming out with Scholastic in the fall of 2018 and will feature women who, at a young age, accomplished daring feats of perseverance and bravery. It’s been really inspiring to learn more about these women’s lives. Thank you so much for having me for an interview! !